or should I say sewer rats and nostalgic cats. to see some tubular treats and feats. Welcome to the 2014 edition of 24 Days of Turtle. The awesome advent calendar kicks off today and runs through the 24th. There will be festive fun, gracious gifts, and Turtle Powered prizes! Everyday there will be something cool, something cowabunga. Let's ride Santa's sleigh to DAY 1 of the countdown. 80sTees.com has mutated the gaudy garment into a style fit for a cowabunga king. Slide it on, and you're instantly set for the joyous season. Whether you're fighting the Foot Clan or attending a holiday bash, the sweater is a sure fire hit. This rad sweater features our heroes in a half shell in the comforts of their slimy, subterranean home. Finally, an opportunity to dress in a sewer-stylin' wardrobe. It's a Christmas miracle! If you need a little color in your collection, 80sTees.com also offers another design. Floating Turtle faces in a sea of snowflakes and a cast of jolly red. The magic doesn't stop once you slip one of these sweaters over your head. I escaped the sewers, and roamed the world to see what other opportunities they offered. Let me tell you, these things serve plenty of other purposes. I found uses that are both naughty and nice! Too old to see Santa? Phesh. Bring your loved ones and go pay him a visit boasting your bodacious sweater. Ol' Saint Nick will be so impressed your name will be immediately placed on his "nice" list. Forget to do the laundry? This fabric is also comfy when you're running low on towels. 'Tis the season to shower. Is this naughty, nice...or just weird? Are your relatives hitting the eggnog too hard? Use it to fend off tipsy family members...like when your Uncle Steve challenges you to a festivus wrestling match. Keep it playful or you'll end up on the "naughty" list. Seriously, the sweater opportunities are endless. Today, the awesome folks at 80sTees.com teamed up with The Sewer Den to spread holiday cheer. 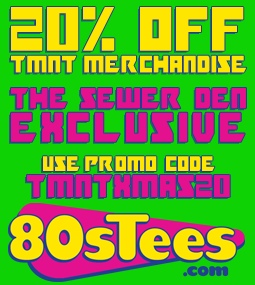 From Dec 1-14, enter the promo code TMNTXMAS20 to get 20% off all TMNT merchandise! Scoop up a faux sweater for yourself - just in time for Cyber Monday. *Note: the promo codes is exclusively for TMNT merchandise and does not apply to shipping costs. I'll be wearing my TMNT Faux Christmas sweaters all season long. Check back tomorrow for DAY 2 of 24 Days of Turtle for more festive fun, gracious gifts, and possible prizes! Until then, stay jolly, dudes & dudettes! Great post as always buddy. I might have to get a sweater or two for some of my unruly relatives. Thanks! Yeah, have an interesting battle with those zany relatives. I'm sure you could use it as some sort of nunchuck too! I got the red sweatshirt, and I wore it when I had my picture taken with Santa this weekend. Now I want the gray one! Awesome! That's so cool. I'd LOVE to see a pic. Hehe, thanks! It's my favourite family photo.